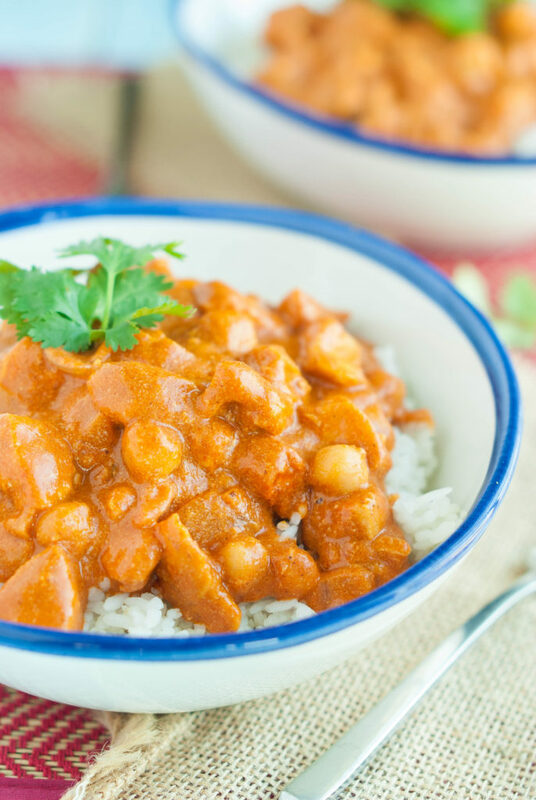 My gluten-free healthy chicken Tikka Masala recipe is so tasty it will make your taste buds explode. No need to call the doctor though, it’s all good. 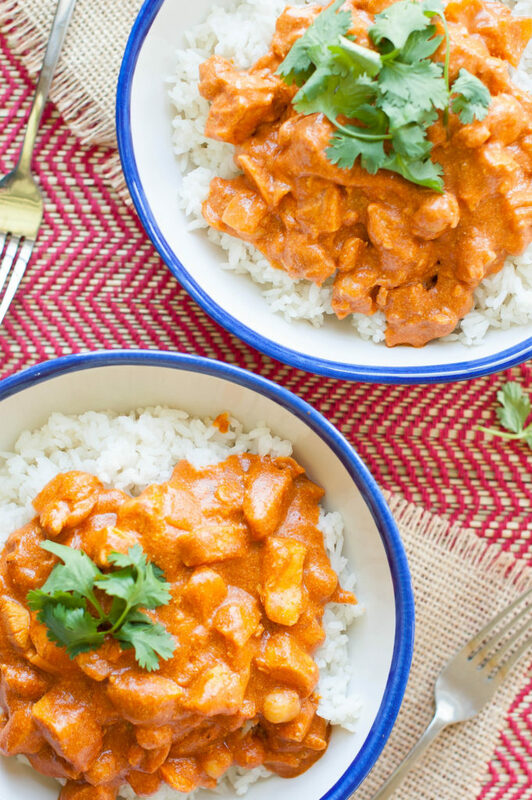 I don’t know if you’ve tried Tikka Masala before, but it’s my children’s favorite. Every time we go out to eat, an Indian restaurant is always near the top of their wish list – and they always want the Tikka. I can barely get them to try anything else since they like it so much. A long time ago one of my friends invited me over for homemade chicken tikka masala. I had no idea that food could be so good. Even so, I shortly forgot about her delightful Indian chicken dish until sometime this year, when all of a sudden I discovered an insatiable craving for the delightful combo of the sweet, somewhat spicy and savory sauce, served over a bed of jasmine or Basmati Rice. I found a store-bought version in a jar that I used in an attempt to quell my craving, but somewhere inside I knew. That jar. That expiration date, so far in the future. Preservatives lurking somewhere beyond the label. 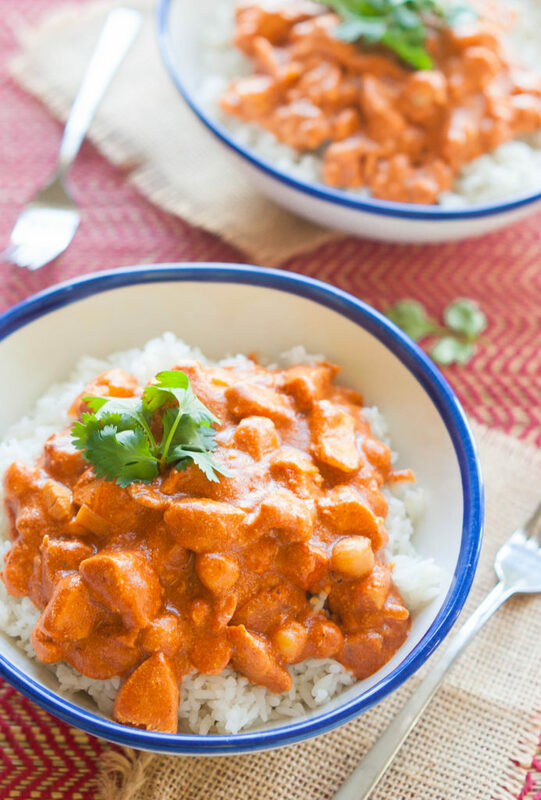 I studied the ingredients listed and decided that I could come up with my own version of healthy chicken tikka masala with coconut milk and a few other pantry staples and have quite an easy and tasty alternative to that delicious dish I tasted so many years ago. The basics of this recipe break down traditional curry powder, but like most people, I personally have all of the separate spices on hand more often. Also, when you break the combination apart, you can omit ingredients, such as the poblano pepper, to adjust to your desired level of spicy, or double up on the more beneficial ones, like fresh ginger, if you need a little digestive boost. Trust me, it’s spicy if you make it this way. But this healthy chicken tikka masala with coconut milk and greek yogurt recipe is goooood, so good, just the way it is. I wouldn’t change a thing! Serve on top of a bed of jasmine or Basmati Rice, with chickpeas on the side, or my personal preference, mix it all in together. If you are like me and have a garden full of tomatoes right now, I’d even go for making your own tomato sauce, if you have the time, that is. That part takes A LOT of time!! Do you have any favorite Indian recipes? Do you make your own curry or buy the premixed kind? This is a recipe for a gluten free chicken tikka masala. This recipe uses Greek yogurt, coconut milk, and chickpeas. Mix greek yogurt, lime juice, ½ cumin, cinnamon, cayenne, black peppers, ginger and ½ salt for chicken marinade. Add chicken cubes and marinade in refrigerator for 1-24 hours. Discard marinade and cook chicken in a skillet over medium heat until cooked through. Meanwhile, melt butter in saucepan and add peppers, brown sugar and garlic. Sauté while adding remaining cumin, paprika, and salt. Add tomato paste and coconut milk. Reduce heat to low, add chicken and chickpeas and simmer until sauce thickens. Serve with or over rice. You can also eliminate the chicken and double the chickpeas for a hearty vegetarian option. YUM! « 9 Gluten-Free Quinoa Desserts – Who Knew Quinoa Tasted So Good? I have an insatiable urge to cook with coconut milk lately and this chicken recipe looks devine.I also love the spices in this one and already know I am going to enjoy this.Thanks for posting it. Your photography is just mouthwatering! I love Tikka Masala and yours just looks DIVINE. Rebecca, this looks SO cozy–perfect for the frigid Midwestern winter I’ve been having 🙂 Thanks so much for sharing on The Makers! This looks so wonderful, I absolutely love Chicken Tikka Masala, and just had some the other day. It’s the perfect cold weather food, all that spice will warm you right up! 🙂 This looks absolutely delicious! I love any Indian food and love roti. I think my favourite is Butter Chicken. This sounds so yummy! Thank you for sharing this post on Found & Foraged! Sounds amazing and perfect for this crazy cold weather we’ve had this week. Your Soup looks extremely flavorful. What do you do with the brown sugar? Thanks for letting us know. Sorry for the in convenience. It is now in step 4 when you add the pepper and garlic. Other than adding crushed red pepper, we followed your recipe to a T.
Our favorite ethnic food is Indian (I am a Brit what can I say?!). You made a fantastic version of masala. Thank you so much it is going into regular rotation. I am taking the left overs to my parents tonight. I am sure they will be just as delighted as we were. Yay! I am so glad to hear that! Enjoy! We have a coconut allergy in our house…. what could we use in place of the coconut milk? Regular milk or maybe even almond milk would work too. Can you freeze this meal? If so, how do you reheat? I don’t know because I rarely freeze anything, but I’ll post it so maybe someone else can answer your question. Have you ever made this the day before and then reheated it to serve the next day over freshly cooked rice? I personally haven’t because I have a histamine allergy and can’t eat leftovers, but I’ll post it in case someone else knows the answer. I’m not sure how you deal with the pepper. Is it diced and then sautéed or is it left whole or split sautéed with other indredients and then discarded. Also is it a 12 ounce can of coconut milk and chickpeas? And finally, does anyone know weight wise how much chicken you use? The pepper is diced and added in step 4. 13.5 ounce can of coconut milk and 15 ounce can of chickpeas and I would say about a pound worth of chicken. Sorry I missed all those things, but thanks to you asking, they are on there now.